The church of the holy fairy lights – For the fainthearted . 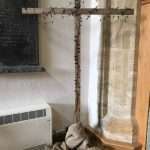 . .
A confession at the outset: for a decade or more, it has been the practice in the parishes where I have ministered to decorate a wooden cross with flowers during the Easter Eve service, intending to symbolise that a symbol of death became a symbol of new life. It has always been a very affective moment, one which appealed to the senses and the emotions as well as the intellect. The church works best when its symbols and ceremonies are at their most affective, when even those who are sceptics and non-believers can find a beauty and transcendence in what takes place. The church seems to have forgotten that the places where congregations have grown are the cathedrals, the places attended by those who go nowhere else are the places of colour and ceremony and customs hallowed by centuries of tradition. It might be incomprehensible to the onlooker, it might be difficult to rationalise, but ceremonies are often like that – who understands many of the military ceremonies? Where the church alienates the casual visitor is when it discards the past in favour of a narrow way dating back only a few decades. Perhaps the double glass doors that had replaced the ancient oak door should have been a warning, but it was not heeded. A plaque in the porch announced that the church had been “reordered” in 2003 through a legacy from a parishioner. If the Victorian reordering of medieval churches is regarded as a form of “vandalism”, then the 21st Century reordering must verge on destruction. If there had been a stone floor, it had disappeared under a light wood laminate on which stood rows of upholstered chairs – the place had all the antiquity of a crematorium chapel and was devoid of a sense of the numinous. A rota pinned to the noticeboard announced the Sunday readings, the pattern of Bible readings followed by most Christian churches around the world had been discarded in favour of local preference. 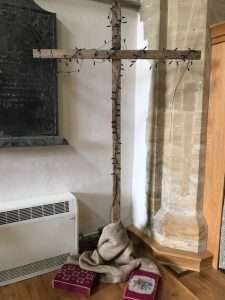 Worst of all was the cross at the back of the church. From a distance, it appeared that thorns had been wound around it, a reminder of the passion of Jesus. Drawing closer, what might have been thorns turned out to be fairy lights. Why would anyone have a cross entwined with fairy lights in August? Why would anyone have a cross entwined in fairy lights at any time? Why would anyone take seriously a church that doesn’t take seriously the crucifixion, the central event in the Christian story? Fairy lights express a theological perspective where faith is about what you can get out of it. “There must be more to life than this,” is the slogan of an evangelical movement that makes no attempt to engage with the reality of human nature, it would have found adherents in a church building where tradition and heritage had been discarded. Perhaps the lights are to represent the Light of Hope as represented by the death on the cross. True a bit hamfisted. I don’t know. I’ve found in the span of my life so far the shift in all the Christian churches while less in ‘active’ numbers are vastly healthier. No longer is the bank manager leaning one way or ‘tother on a loan. No longer are businesses dependent on visible attendance. No longer are farm leases dependent on sitting 1,3,7 rows behind ones landlord. The rows being how many acres you held off him or her. True, in the countriside it was a lot easier when people fitted into a neat slot. Could be measured and weighed by church attendance. And conformed to an imposed expectation. But the truth is if we played the cards as dealt I wouldn’t be making Art, nor you a churchman. And it can be quite hard to swim against currents, even when they are lessened. I’ve been spelling Countriside with an ‘i’ for so long it’s not funny. Did I miss the meeting when we decided to use a ‘y’.